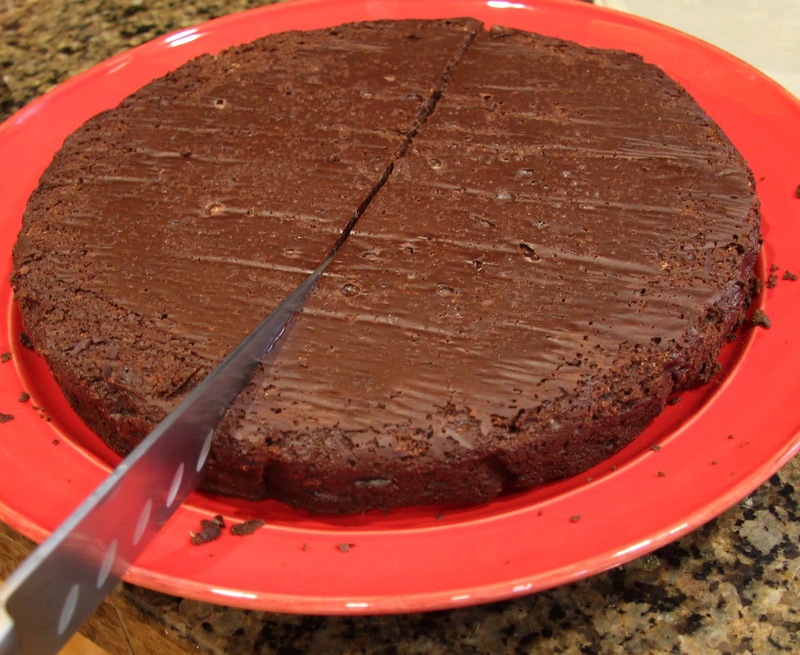 I made many Chocolate Truffle Cakes in my years baking at my family’s restaurant in Eugene. It was one of my favorites because it’s relatively quick and easy but so rich and elegant that customers would rave about it. I often served it with raspberry sauce and would have done the same today but I had this lovely salted caramel sauce in my fridge and no raspberries in my freezer. 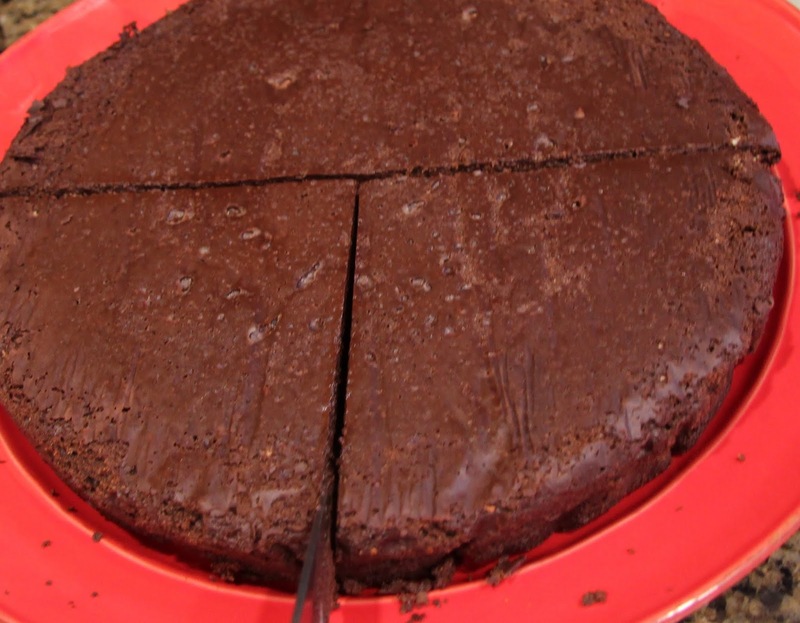 That’s another really great thing about truffle cake, it’s so versatile! 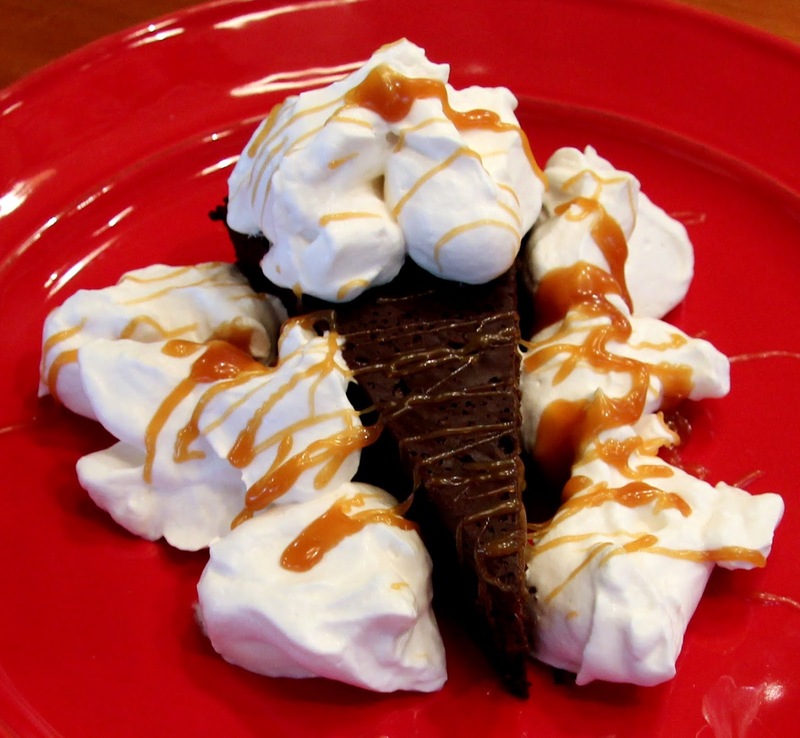 Use it as a base and let your imagination and taste buds guide you or simply enjoy it with a dollop of whipped cream. Fresh strawberries are, of course, fabulous with it! 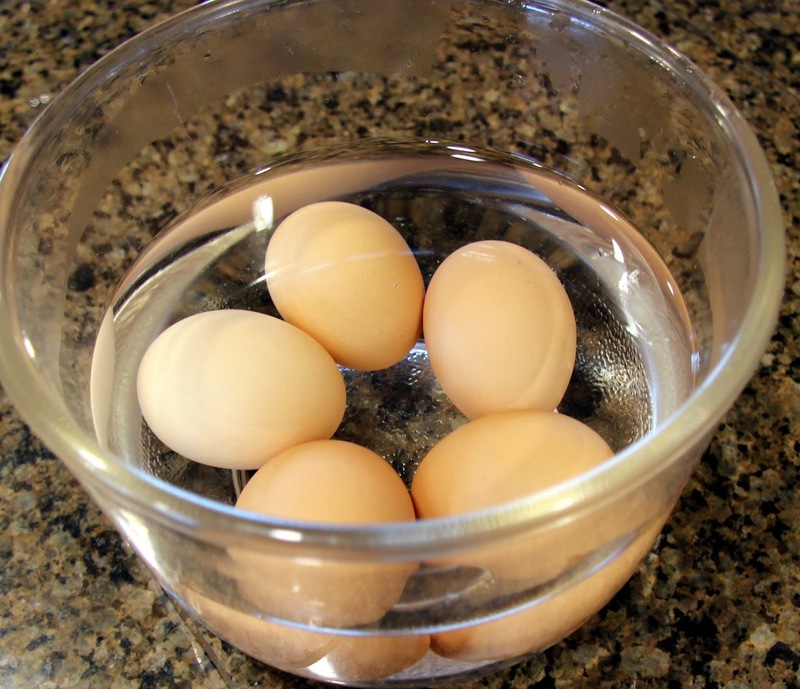 Place eggs in warm (not hot) tap water for about 10 minutes to quickly bring to room temperature. In my experience, room temperature eggs are easier to separate and more voluminous when beaten. 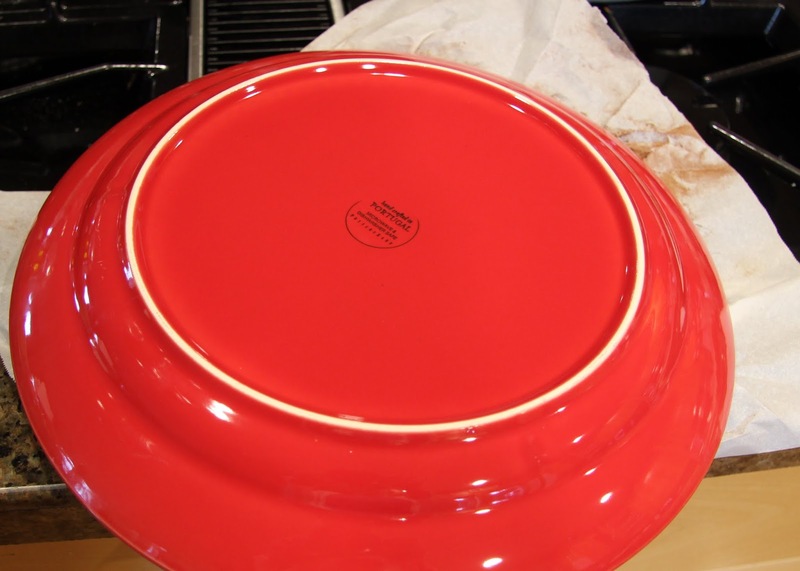 Prepare a 9-inch round cake pan. 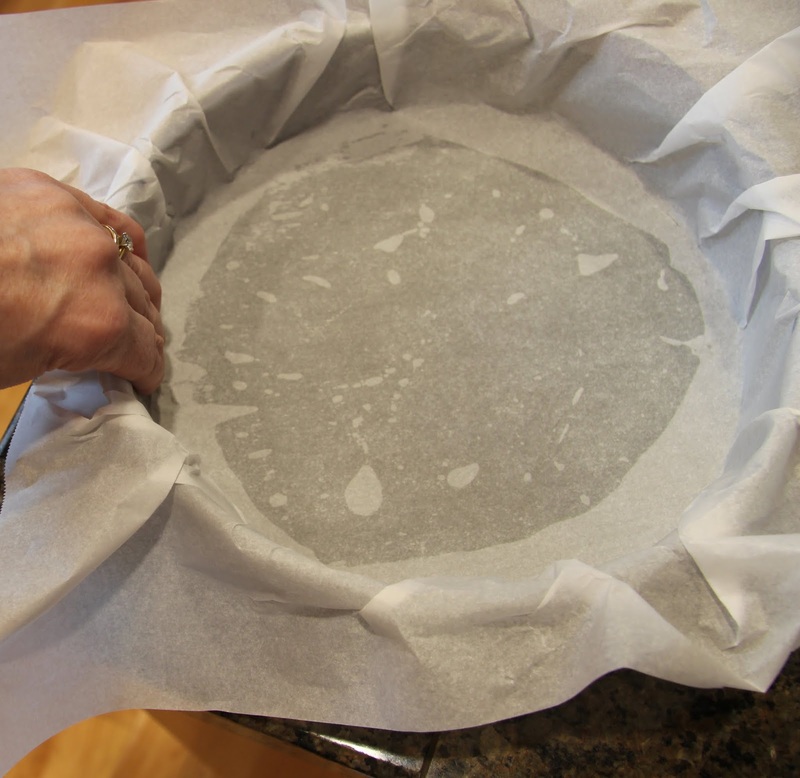 First, oil the pan a bit so the parchment sticks better, then line it with parchment paper or foil, making sure there is overlap. 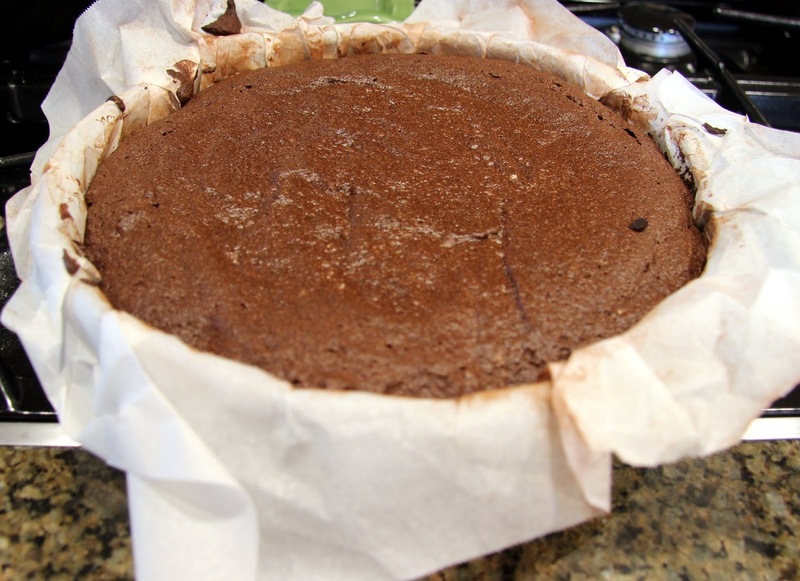 You will be using the paper/foil to lift the cake out of the pan. Coat the paper (up to the top of the pan) with melted butter. 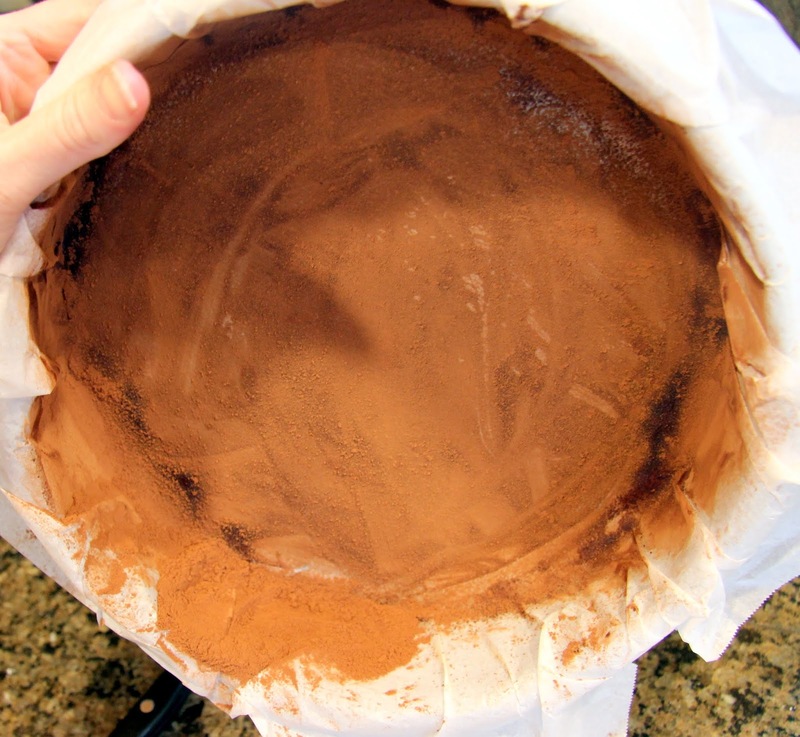 Sift cocoa powder to coat the bottom of the pan. 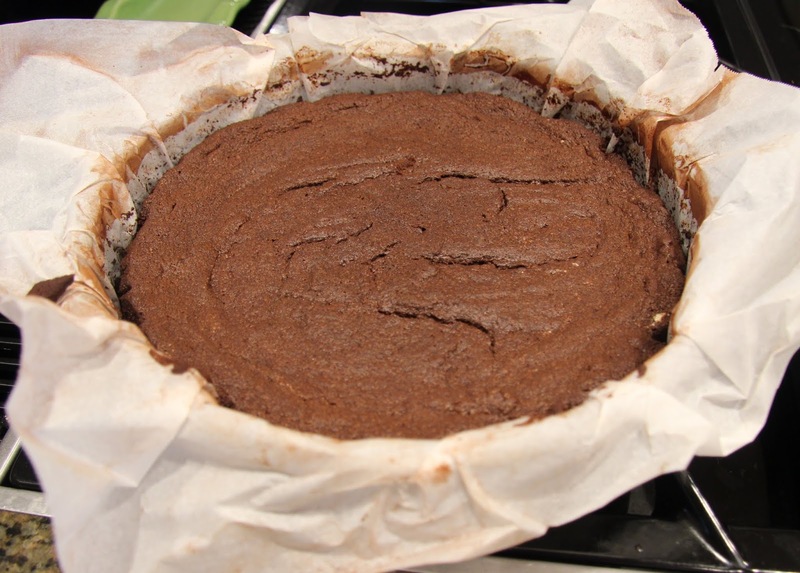 Then rotate the pan on its side, tapping lightly, to coat the sides. 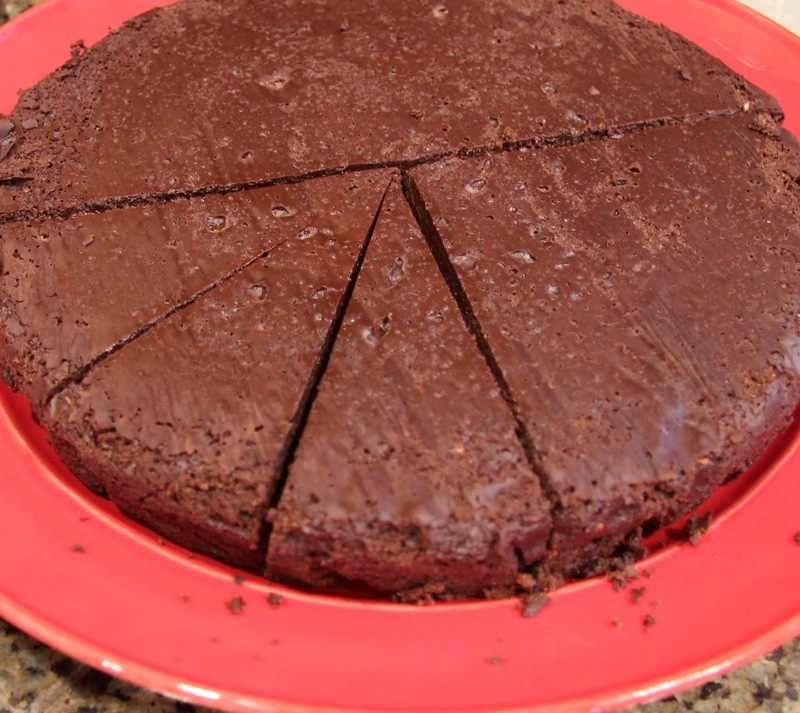 Chop chocolate, if necessary (I had buttons). 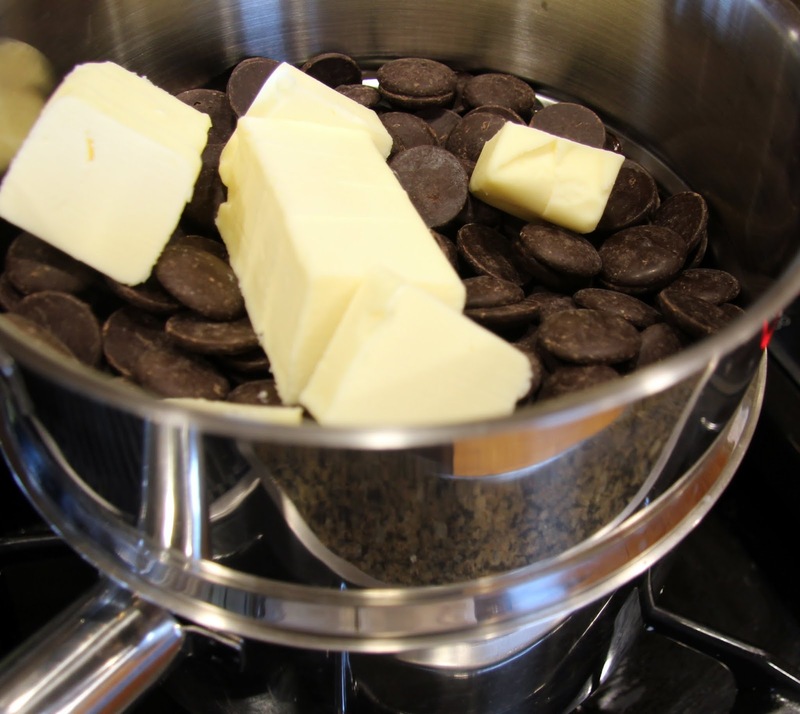 Place in a double boiler with butter. Melt on medium heat over, not in, the water. 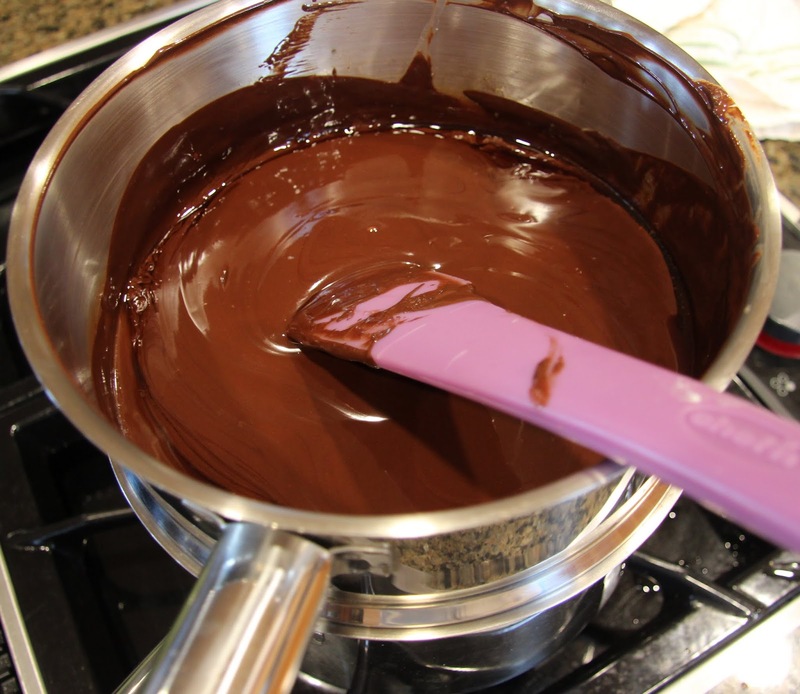 If you don’t have a double boiler, you can rig one up with two saucepans or even melt the chocolate and butter in the microwave. 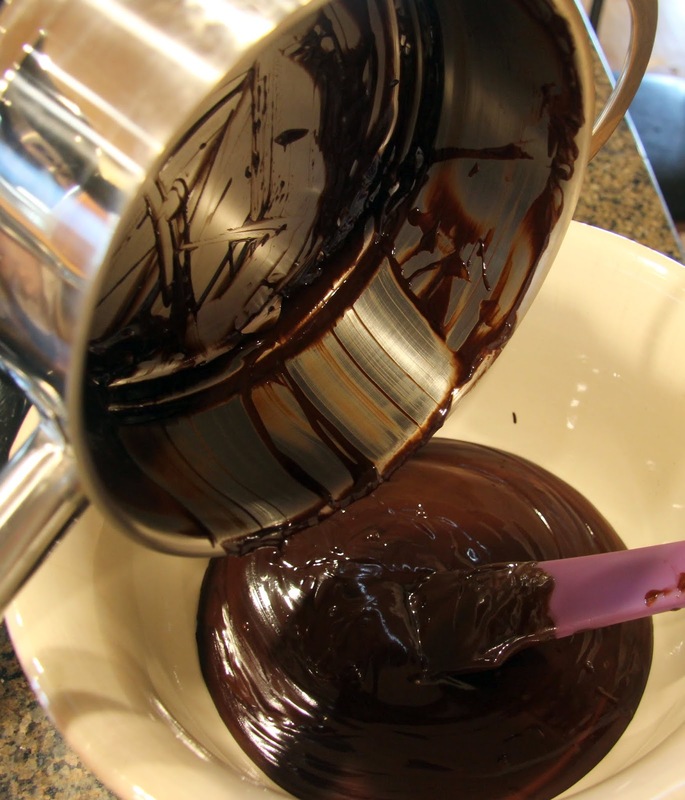 Always stir frequently while it’s melting and never let chocolate get too hot! Meanwhile, separate the eggs. I find the hand method easiest but you can certainly do shell to shell. 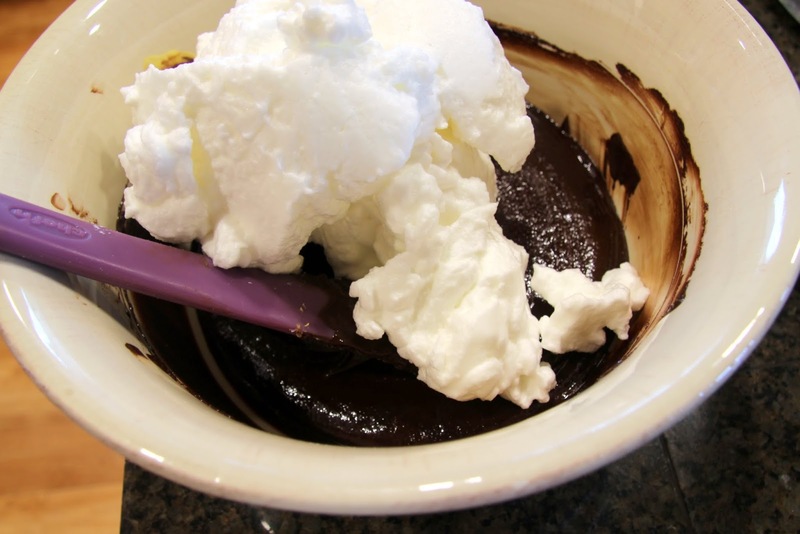 pour it in to a large mixing bowl. 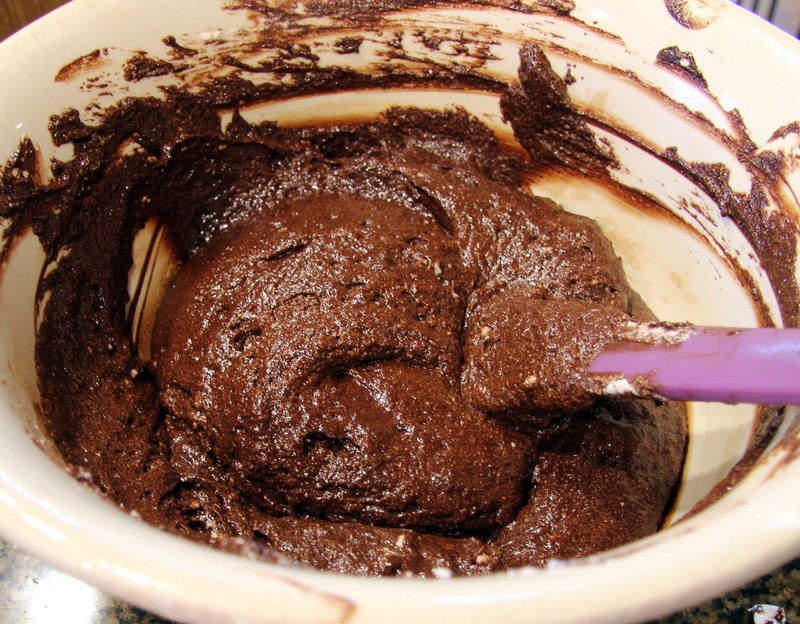 Stir in vanilla and coffee extracts and salt. Allow to cool to lukewarm. 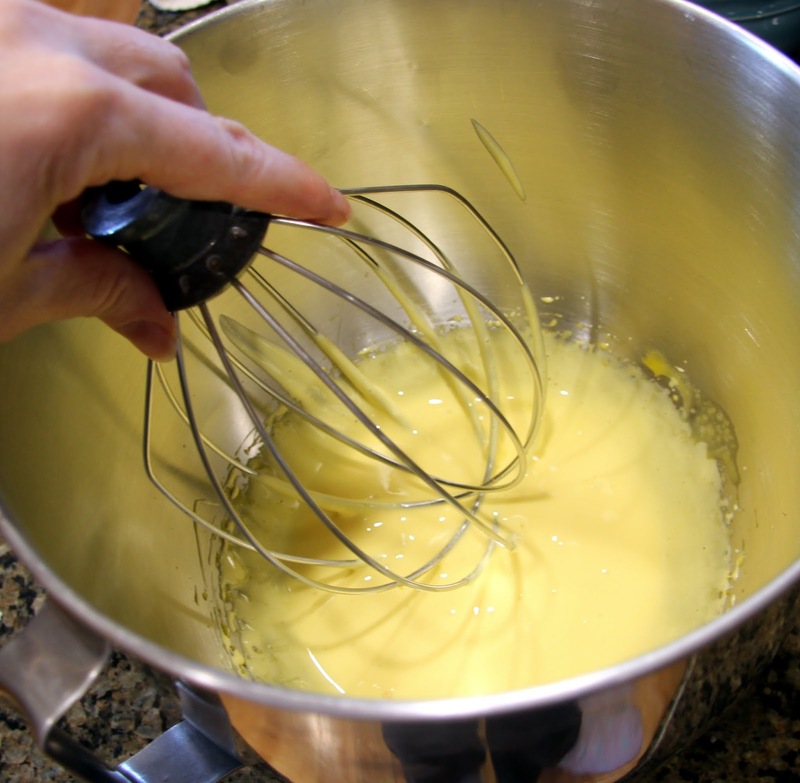 Meanwhile, beat egg yolks on high speed with a stand mixer or hand held beaters until they are thick and pale yellow. 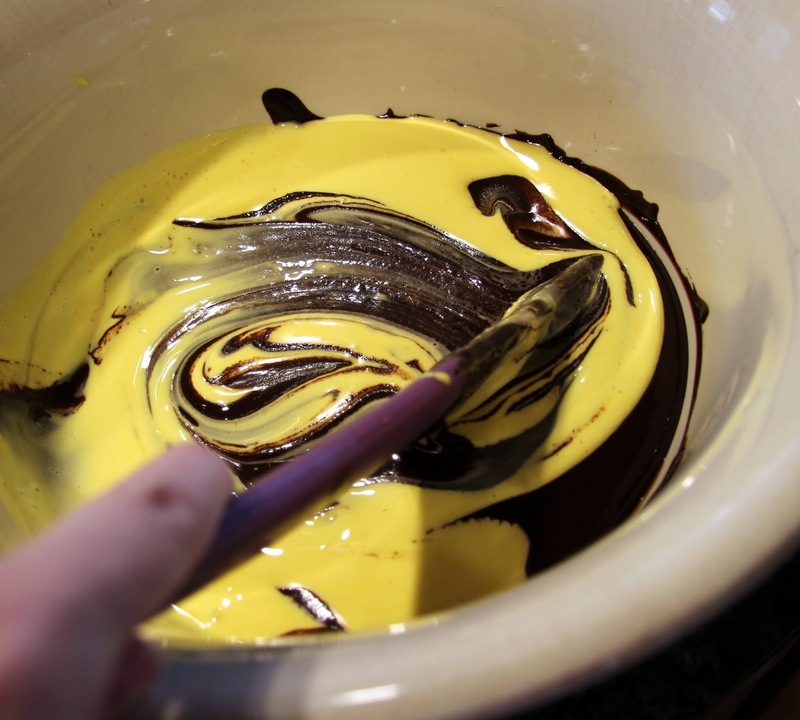 Gently, fold yolks into cooled chocolate mixture. 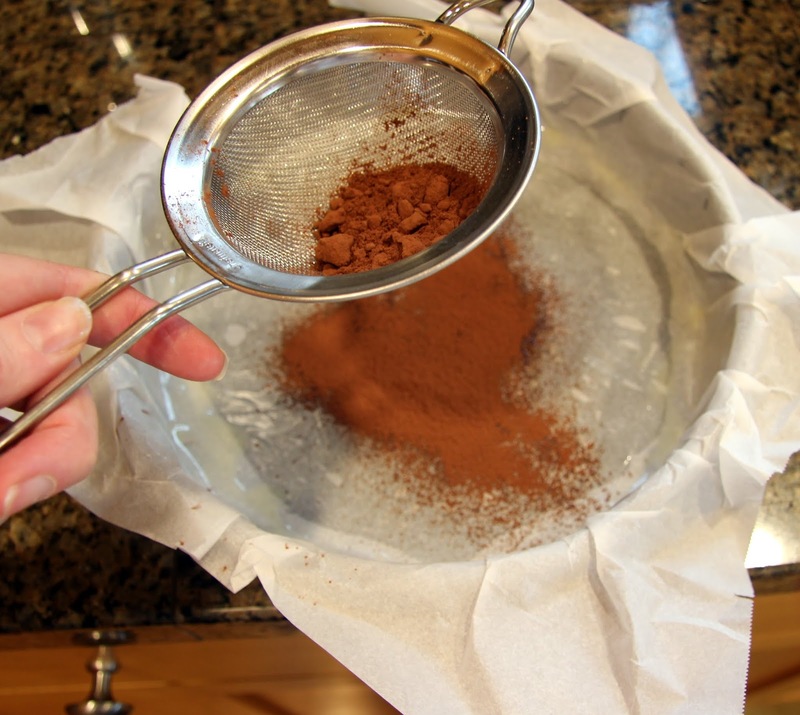 Folding is different from stirring as you actually fold the mixture over itself with a rubber spatula rather than stirring it, making sure to scrape the sides of the bowl. 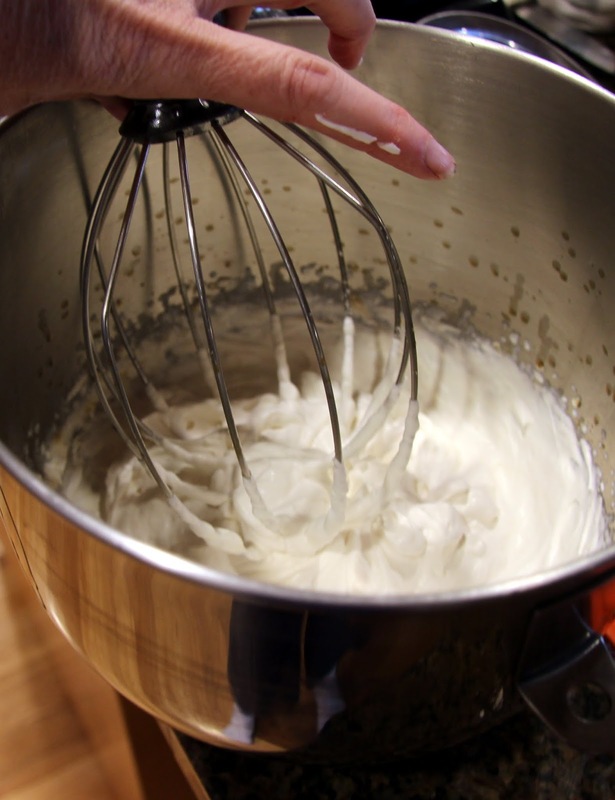 It especially important when incorporating egg whites as they are likely to break down if stirred too vigorously. Set aside while you whip the whites. If you are using the same bowl to whip the whites as you did the yolks, it’s very important to clean it thoroughly as any residue from the yolks could slow the whites from beating properly. 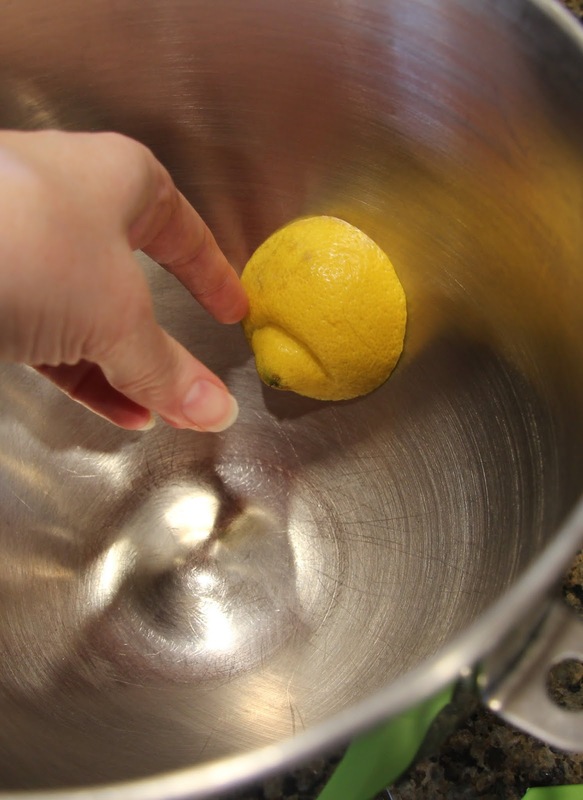 I even go so far as to rub some lemon in the bowl to ensure maximum voluminosity because the acidity breaks down the fat. Not absolutely necessary though. Beat the whites on high speed until soft peaks form. Add sugar at this point and continue to beat until stiff peaks form. until fully incorporated. Do not over mix! 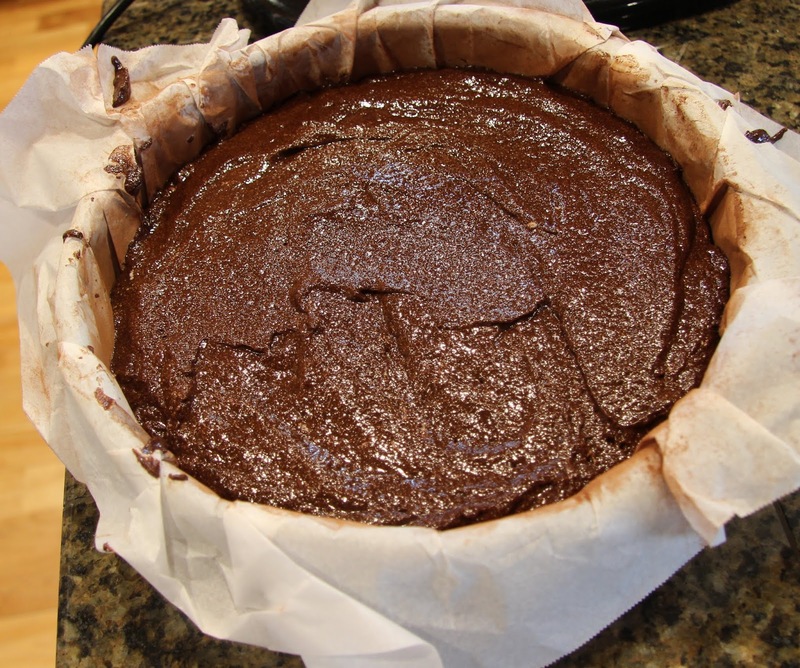 Bake for 20 – 25 minutes on the middle oven rack until the cake has risen to the top of the pan and the top is beginning to crack slightly. 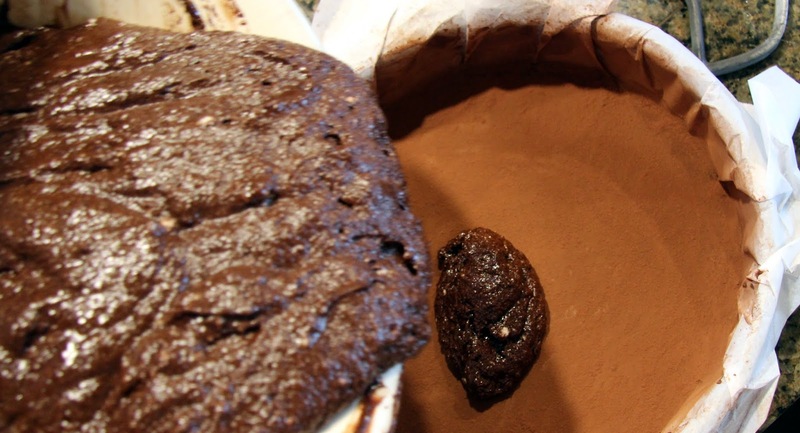 You want to be sure to not over bake the cake, it should still be a little jiggly, not fully set. I baked mine for 22 minutes and it was perfect but oven temps can vary so check it at 20 minutes, sooner if your oven runs hot. The cake will sink a bit a few minutes after it comes out. This is fine and normal. 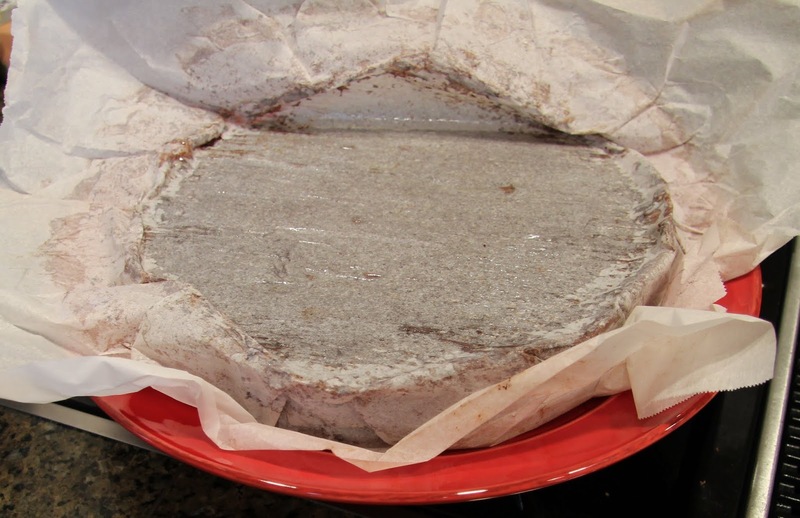 Allow it to cool on counter for about 30 minutes then transfer to your refrigerator. Let it chill until it is set, at least 3 hours and up to 24 hours. It should be completely firm when set. 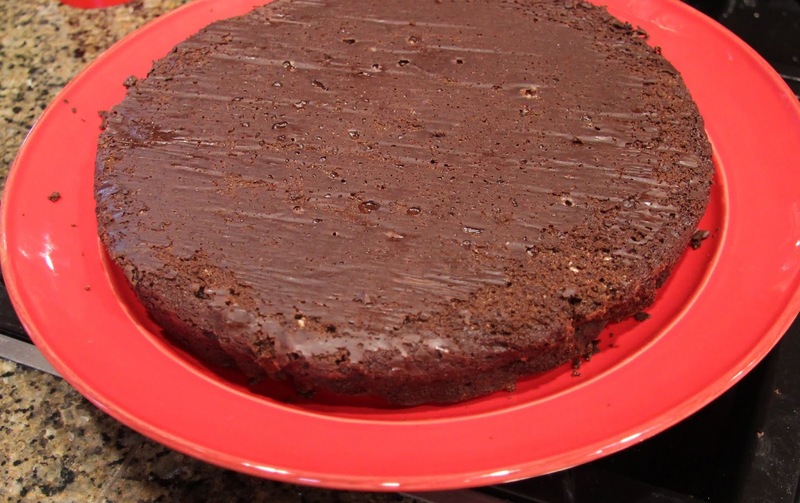 Lift the cake out of the pan and invert on to a large plate or platter. 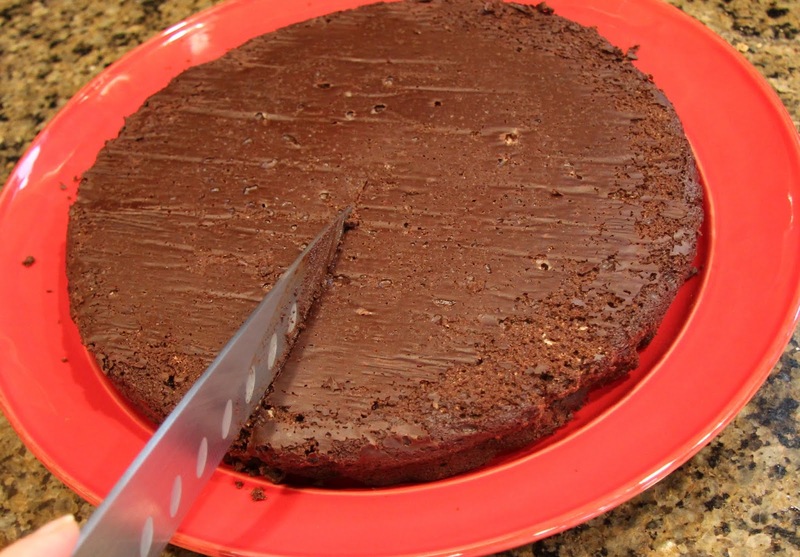 To cut, run a knife under very hot tap water, dry knife, and make a cut halfway across the cake. Repeat with hot tap water, wiping off excess, and make a cut to meet the first. until you have 12 pieces. If you are not serving it all at once, stop at a few and refrigerate the remainder uncut. 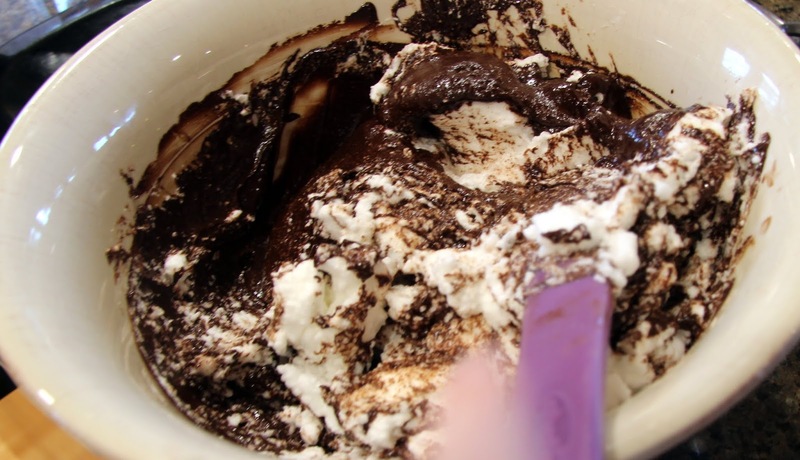 Here are some simple instructions in case you’ve never whipped cream. 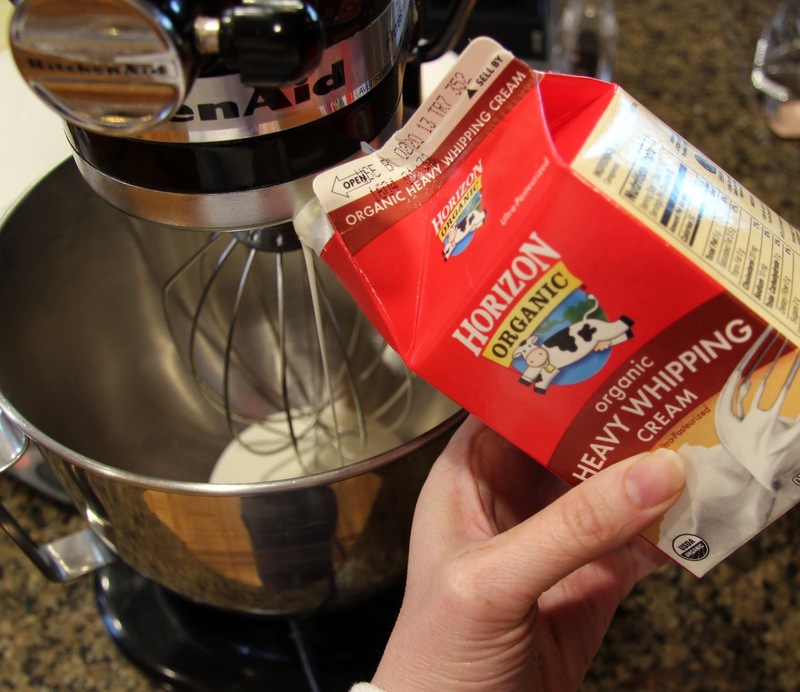 Start with 1 cup (8oz) heavy whipping cream. Starting on slow speed, working up to medium-high speed, beat with stand mixer or hand held beaters until it starts to thicken. Add 1 tsp vanilla extract and 2-4 TB sugar depending how sweet you want it and continue to beat until nice and fluffy, like whipped cream should be. 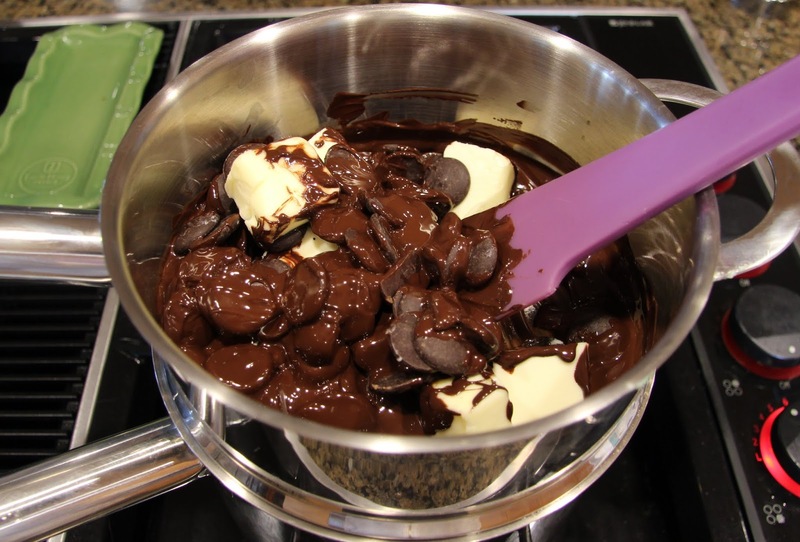 If you are using a stand mixer, be careful not to leave it mixing too long or it really will turn into butter. Garnish the cake with whipped cream and any sauce, fruit, nuts, etc. you desire. 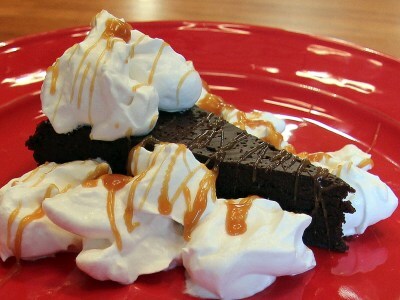 The salted caramel sauce was insanely good with it. I’m so fortunate to have found my perfect weirdo so long ago :)!